These are set out by BS 7671 the IET wiring regulations. They also set out guidance for complying with the Electricity at Work Regulations 1989. The regulations cover design, selection, erection, inspection and testing of electrical installations. When we carry out work for you, you will receive an Electrical Installation Certificate. 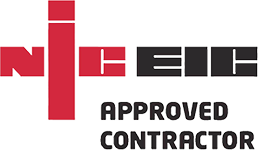 This guarantees that your installation was designed, constructed, inspected and tested in accordance with BS 7671. Regular inspection reveals faults and hazards in your electrical circuits. It may be that they are overloaded or pose a risk of fire or electric shock. Defective work can be identified and safety checks carried out. Following inspection, we will produce a full report on any issues discovered. This will inform you of any upgrades or repairs that are needed. This may include everything from wear and tear to unsafe deterioration or damage. The report will itemise work required and the cost of each element. Our experienced electricians can resolve any issues identified in our report. However, we will never go ahead with work without your express approval. You are free to put in place some or all of our recommendations at a time to suit you. Electrical works from major installation to minor adjustments require official certification. Our qualified professionals will provide you with all necessary paperwork. This provides the peace of mind that comes with knowing your circuits are safe.Documentation may also be required when a premises is sold.